An amazing selection of black and white photographs have a great impact in a Warwickshire gallery, far away from their source. Introducing America to Americans – The Farm Security Administration Project, 1935-1944 is the title of the exhibition at The White Room Gallery in Leamington Spa. The photos may appear familiar if you visited The Human Document exhibition at the Mead Gallery at the University of Warwick back in autumn 2016 – they were previously part of that bigger exhibition. However here in the smaller space it’s easier to focus on the detail. In 1935, The Farm Security Administration Programme commissioned some photographers to document the plight of rural workers in America to enlighten the public and politicians about the living conditions of the working classes during the Great Depression. They brought an awareness of poverty to a much larger audience. Amongst the photographers featured is Dorothea Lange, and her photograph of the 32-year-old ‘migrant mother’ of seven children, Florence Thompson,(above) with a baby and two young children in a pea picking camp, became a famous image, her tough life leaving her looking much older than her age. Lange’s other photographs here include many people with the pain of poverty on their faces; a sharecropping family on the move, mum in a bonnet clutching her baby, a sad little boy and anguished father. There are black cotton pickers, who worked from 6am-7pm for $1. Other photographers involved include Arthur Rothstein, whose works include School at Alako, where youngsters sit around a heater while a woman writes on the blackboard; learning still trying to take place amongst the struggle to survive. Russell Lee also photographed a mother teaching her children numbers to help them back to a better life. Lee’s photograph of a former slave woman pictured in 1941 is also shocking, a reminder that slavery was not so far into the past. John Vachon’s pictures show the sad furniture of evicted share croppers sitting by the roadside. Families have a whole street of furniture lined up one side of a roadside stream they cross with planks, a tragic place to have come to a stop. Amongst it all, children create their own playground from an old wagon wheel placed on something to become a merry go round. There is just one of every image on sale at this moving and fascinating exhibition of silver gelatin prints, which is on until November 17. Echoes of the seaside feature in the new exhibition at The White Room Gallery in Leamington. Entitled Land and Sea, the show in the Regent Street gallery includes a lot of works by Philip Goddard, with some works by other artists too. Birmingham-born Goddard studied at The Slade School of Fine Art and Chelsea School of Art, and has been a White Room favourite since the gallery opened 15 years ago. 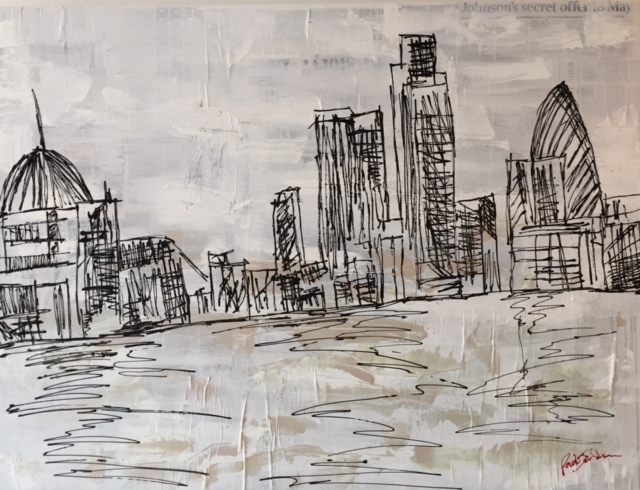 In his collection in this exhibition, The Constructed Landscape, he uses found objects from along the Kent coast where he once lived, paint and other materials to conjure up images of a landscape or coastal scene. There are small bits of wood, and lots of mesh metalwork, sometimes painted over or painted through, with some constructions looking like part of a boat, or a distant boat afloat. There is lots of blue and yellow paint, and constructed landscapes in box frames. 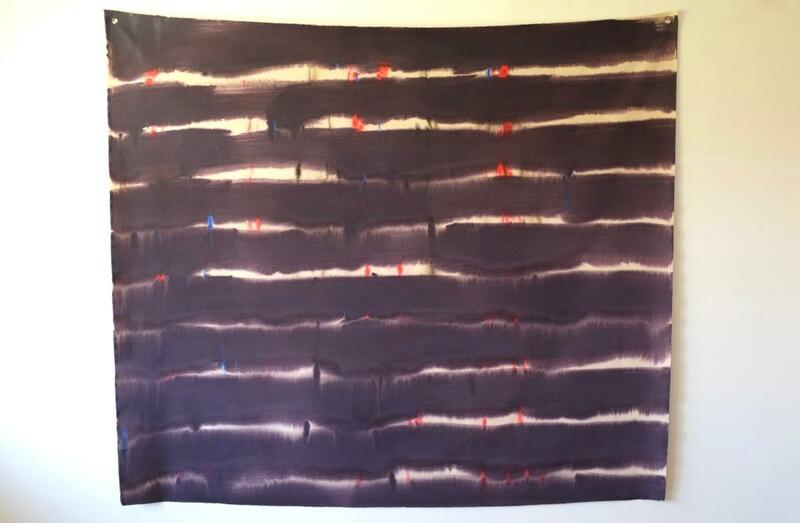 There are monoprints again using the mesh pattern, and some with a dark stripe to one side looking like a flag. They are refreshing to look at and definitely bring a feel of the sea to the Midands. 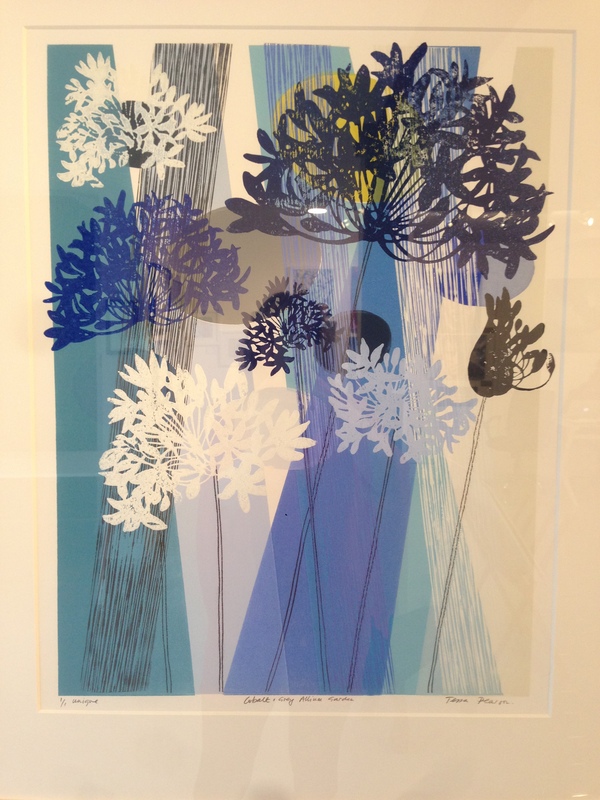 Other artists in the exhibition include Adrian Bradbury, who studied art at Goldsmiths and went on to work for Bauer, DuPont and others, and who is showing a set of prints entitled Coast, which feature layers of colour. Tim Southall is a regular exhibitor at The White Room Gallery, and is showing some more of his drawings in this show. It also features works by his great uncle, Sir Frank Job Short, who was born in 1857 in Stourbridge and trained as an engineer, but his passion was for art. He became Professor of Engraving at The Royal College of Art in 1913, and this exhibition shows several of his etchings, lovely scenes of long-ago life; seaside folk on a quay, a windmill, a village with churchtower and a man at work. In the centre is Coming Home, by Tim Southall, showing someone in a lit-up night walking towards a house. 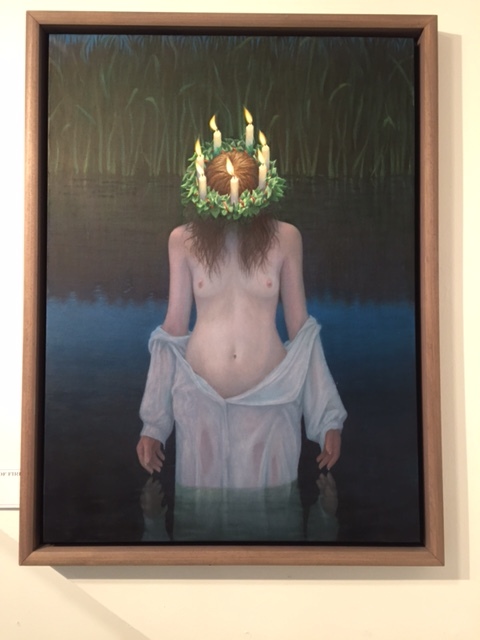 The exhibition is on until May 25, and worth visiting for the variety of works by a number of talented artists. A slightly puzzling exhibition starts the new year at Leamington Spa Art Gallery & Museum. 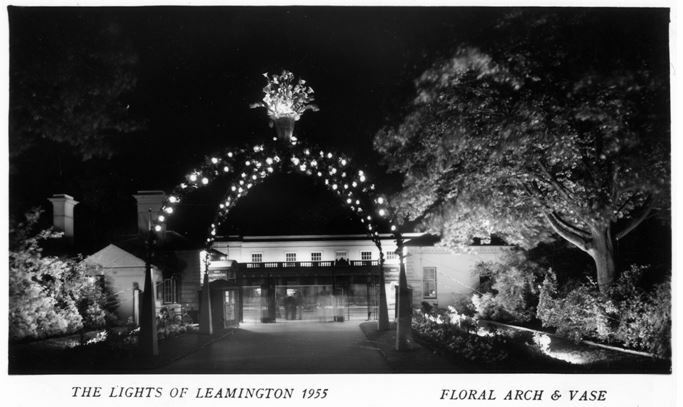 Back in the 1950s, Leamington’s response to the Festival of Britain was its own festival called The Lights of Leamington, which apparently drew 300,000 visitors to the town. Jephson Gardens was lit up with thousands of coloured electric lights to create a wonderland, with the event so popular it was repeated up until October 1961. It only came to an end then as it was a victim of its own success, increasingly costly to run, and with complaints about visitor rowdiness. There was even an attempt to revive it in the 1980s but it was too expensive. So as the gallery’s new exhibition Lights of Leamington was inspired by it, I’d expected to see more photos of this amazing creation, and it was a bit disappointing to find only one cabinet of black and white photos, showing what looks like lovely scenes of characters, creatures and lit-up trees and walkways. The exhibition, described in its own publicity as eclectic, has been selected and curated by Birmingham-based artist Stuart Whipps who has gone through the gallery’s collection and followed the theme of light through it. This means the rest of the display has this general theme. Whipps himself has added one work involving burned bits of photo negative found in the collection. There are paintings, including some of people or things lit by candlight; Godfried Schlacker’s self portrait by candlelight is a striking work dating back to 1695, and Christmas Roses by James Valentine Jelley from 1856 shows the flowers gently illuminated. A painting entitled Moonlight showing two boats under the night sky was one donated by Alderman Holt, the subject of a previous exhibition, and a travel poster shows the bright lights of the Ostend Casino as a draw to visit Belgium. Kathlen Mary Lamphier Calcutt’s Park Farm, Stareton, is an attractive watercolour, and Catherine Yass’s colourful lightbox work shows a figure and a strange flash of light at Guy’s Cliffe, near Warwick. Many people have happy memories of Leamington’s Toytown shop, and Stuart Whipps has found the letters from its sign in the archive, and displayed them with LED flashing lights included in the exhibition, but in the order they came out of the storeroom, so not spelling out the word – still it’s a good reminder! Other additions include metal candlesticks and a collection of photos of streetlamps in Leamington. Eclectic is certainly one word for this slightly strange connected, yet rather disconnected, exhibition. Hopefully visitors will come forward with more memories and pictures from the 1950s show for a follow up. *The exhibition runs until April 15. 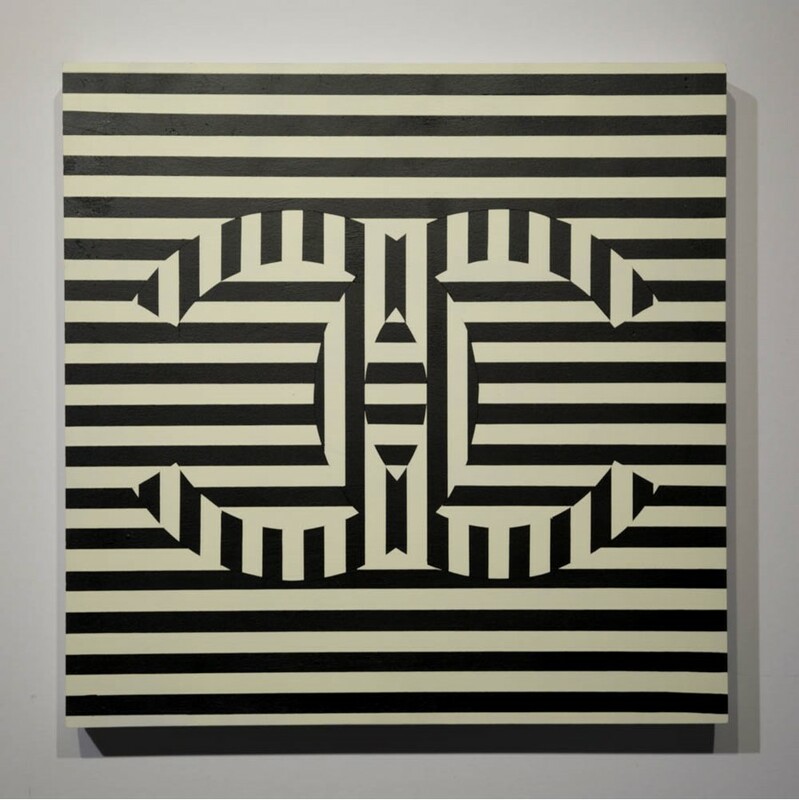 Op Art may not be new, but there are some new names to savour from across the decades in Op Art Past and Present, on show into the new year at The White Room gallery in Leamington. Gallery boss John Gilks is a fan of op art so much of what is on show has been in his possession for some time, and he has provides short biographies of the artists to further inform us. Ivan Picelj was a Croatian artist and a particular favourite of John’s, so much so he once nearly visited Zagreb to track him down – them bitterly regretted not making the trip when the artist died in 2011. 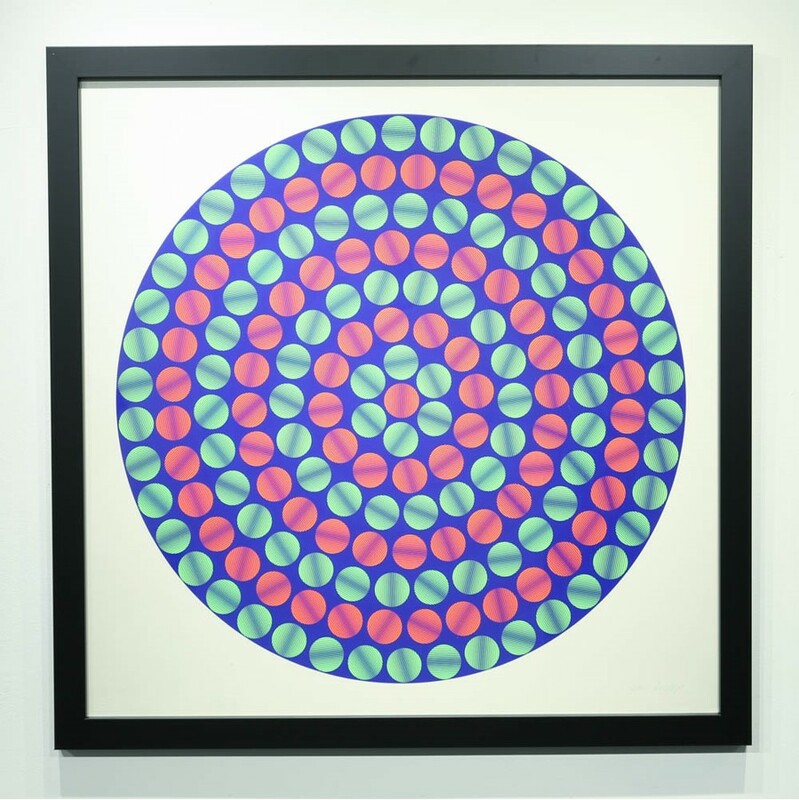 At one end of the gallery are three of his untitled works, large colourful circles, made up of coloured circles within (pictured above). 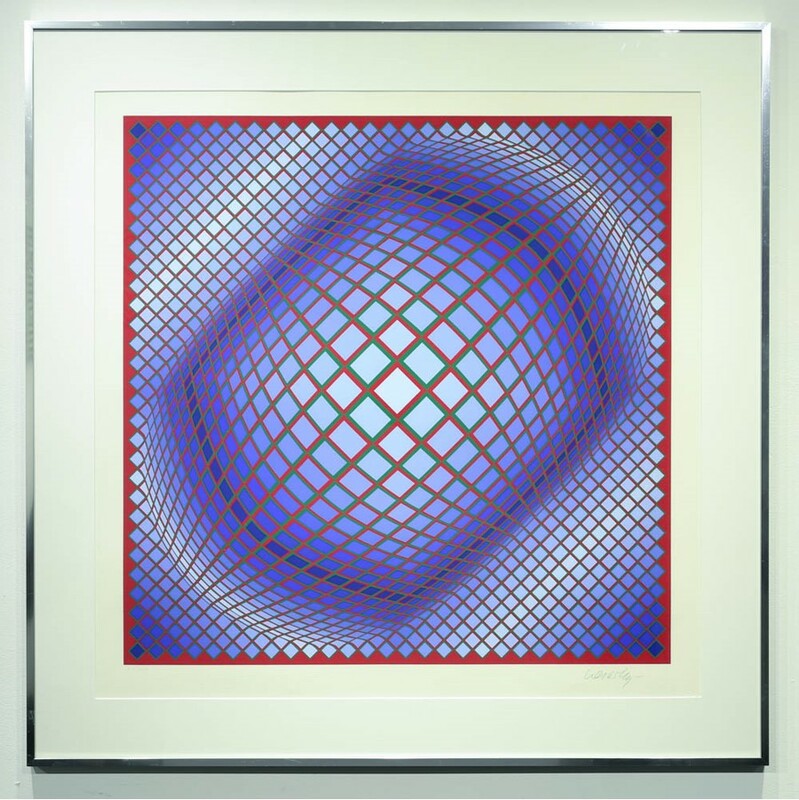 Described as the grandfather of op art, Victor Vasarely is represented by a strange work that seems to warp and move, with net-like circles and squares (above). Genevieve Claisse was born in 1935 in Quiévy, France, the great niece of abstract painter Auguste Herbin. 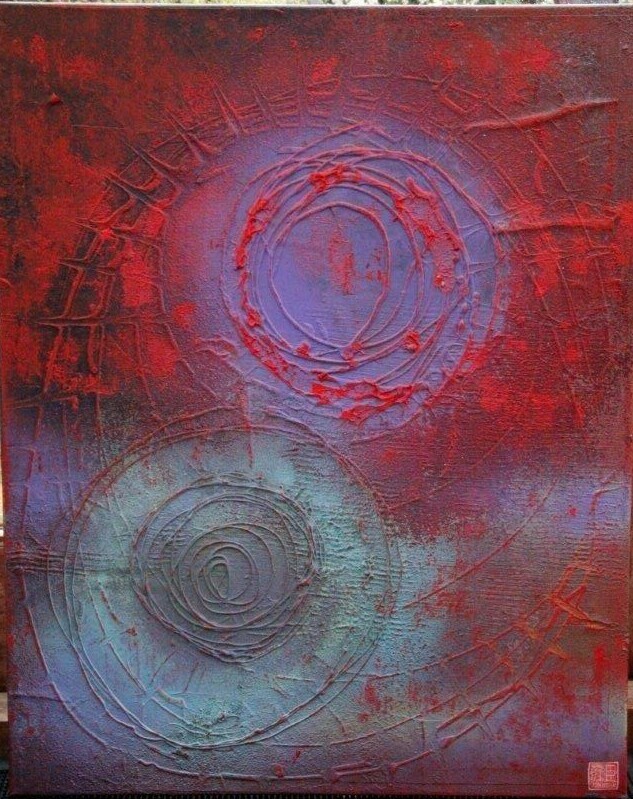 Her prints on show here are large, overlapping circles. Carlos Cruz-Diez, who was born in 1923 in Caracas, creates metallic works and there are circles and squares here in different colours which look different as you move around in front of them. There is a swirly purple and green print by Bridget Riley, and going down the age range somewhat, Damien Hirst is represented by one of his dot paintings. The very present is represented in the exhibition by Carl Cashman (one work, Chanel, above), with several of his works included. Cashman is more of a street artist who is inspired by Op Art and created a long mural on a wall at the Glastonbury festival. Here there is Peace Hurts, the CND symbol hidden amongst blue and white stripes. Jam Hot and Hot are more like street art, small but with glitzy paint. Love Hurts has the letters for Love in different colours in a square. It’s an interesting exhibition, introducing some older artists who are still not that well known except to op art aficionados. The wartime paintings of a secret group of artists drafted in to help keep the military mission safe during the Second World War are on show at Leamington Spa Art Gallery & Museum. Concealment and Deception: The Art of the Camofleurs of Leamington Spa 1939-1945 tells how during the war many artists were brought to the town to work on developing camouflage for strategically important installations. The works in the exhibition are a mixture of their depictions of this work, and paintings and drawings they did on their down time, presumably to keep themselves busy while away from home. Some of the latter depict the local scenery, and others the area under attack. Evelyn Dunbar’s Convalescing Nurses Making Camouflage shows the women working hard on table and floor to put together khaki-coloured cloth. Dorothy Annan’s The Parade, Leamington Spa, 1944, shows the area just up from the Pump Room Gardens and is instantly recognisable, though it’s notable the streets are full of walking people and cyclists rather than cars. Stephen Bone’s Clarendon Street from 1940 shows the attractive street covered in snow, and Christopher Ironside (father of renowned agony aunt Virginia) did a watercolour of Lansdowne Circus, the attractive houses sporting taped-up windows to guard against blasts. Janey Ironside drew evacuees in Leamington, a sad looking boy and girl in outsize clothes. Some works give hints of what has been lost. There is a sketch by Dorothy Annan of a panel for the British Restaurant in Leamington, which was to be one of six by different artists. It is drawn with a strange perspective, showing familiar sights such as the Jephson Gardens and the Parade, but sadly the mural is lost. Mary Adshead’s Grace at the Sausage Hatch depicted a woman serving some unidentifiable food at the British Restaurant in Coventry, as two gaunt and desperate looking men queued. There are a lot of works by Colin Moss, who had studied under Oskar Kokoshka, including Camouflaged Factory Building, 1939-41, depicting the building painted to try to blend in with the ground from above. But he also did more landscape works, including House Seen From Picket Fence, and a cabbage field. They are in varied styles, influenced by colourful expressionism and his lifelong interest in depicting ordinary life. Danger Deep Water shows a wonky sign around a pool and bare trees, with a bombed out shed behind. The Big Tower shows a tower he painted in camouflage paint – and then painted in this picture. Rodney Burn did watercolour cartoons often pointing out ironies of war; in one a group gather around a tiny cabbage, saying it’s just the start, a reference to the Dig for Victory idea. Robin Darwin, who went on to lead the Royal College of Art, painted the spraying of an airfield to disguise it as a field, and Edwin La Dell painted The Camouflage Workshop itself, a dark room with men peering at designs on desks. Unbelievably, Leamington also became the base for the naval camouflage unit, with a pool to test things – a slightly surreal painting by James Yunge-Bateman shows The Outside Viewing Tank, with what looks like a giant woman wrist-deep in the water with a tiny boat next to her. It’s an excellent and fascinating exhibition, showing works by artists who went on to bright careers but who left behind these wonderful artistic reminders of their war time life in Leamington. The Summer Exhibition at Deasil in Leamington brings together some artists from their stable of regulars whose works are shown in venues such as restaurants around the Midlands, plus some newer artists. With pieces by about 14 people on show there is quite a variety of themes and styles of working. Coventry-based artist Nancy Upshall has three pieces here, including the oil painting Twisted Flax, a small work with a concentration on the turns in a material, and a larger work, Motley. 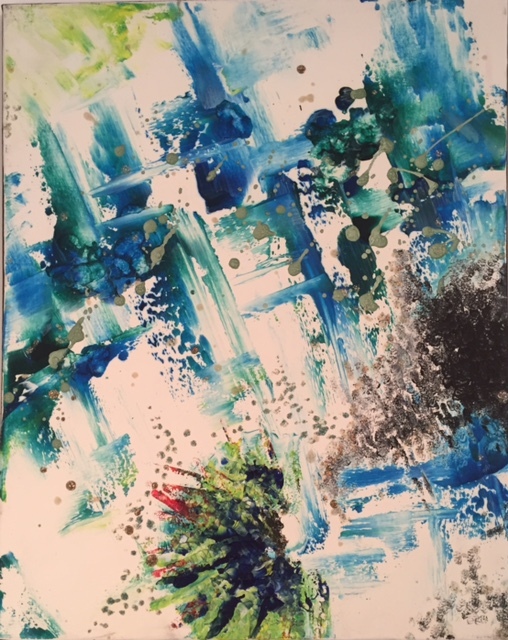 Susannah Rourke’s April Showers (above) are four paint and mixed media works of splashes of movement and colour, which can be rearranged into a different pattern if preferred, as can another set called Here I Am. Chris Putt’s large digital print of St Ives is recognisably the resort, with colour added to the buildings. 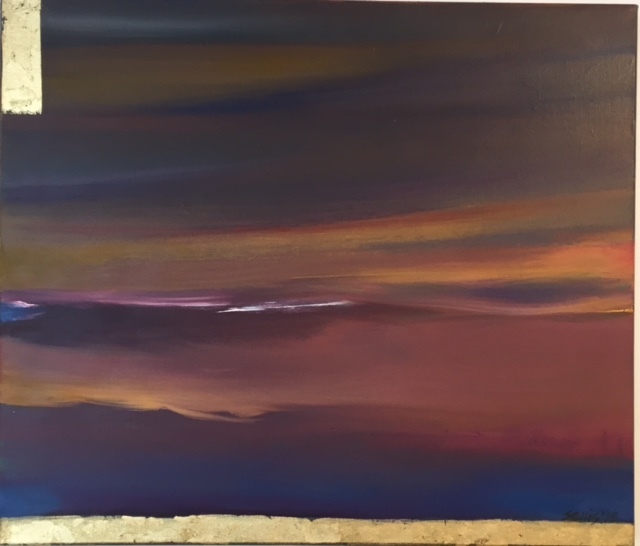 Stuart Ellis’s Sea Moon (top) has a gold base, with purples, oranges and golds going up into the sky, and is very effective. Sonia Bublaitis’s works are very colourful, with vivid paint patterns on Perspex. In contrast, Mark Allan is showing close-up wildlife photographs to make the keen amateur envious. 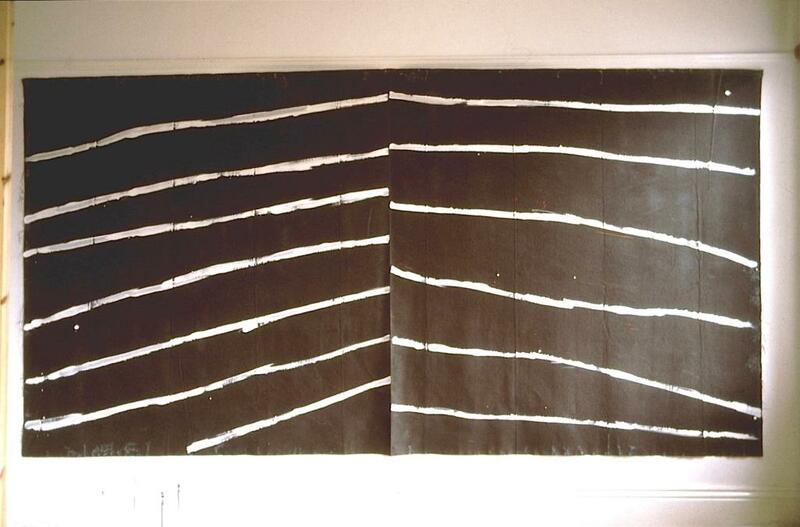 Paul Jordan’s City Limits (above) is a mixed media piece, with buildings drawn in black lines over a board on which newspaper has been stuck, and painted over white. You can tell it’s recently done from the headlines about Johnson and May visible underneath. It’s another enjoyable and varied exhibition from the gallery which changes its exhibitions every three weeks. The latest exhibition at Leamington’s Deasil Gallery features works by a number of the gallery’s artist clients. At the opening night, one artist with a tale to tell was present. Chelsea ‘Bunns’ Johnson is 24, originally from South Africa and a survivor of seven years of drug abuse. She now lives in Warwickshire though is soon to move to Coventry. 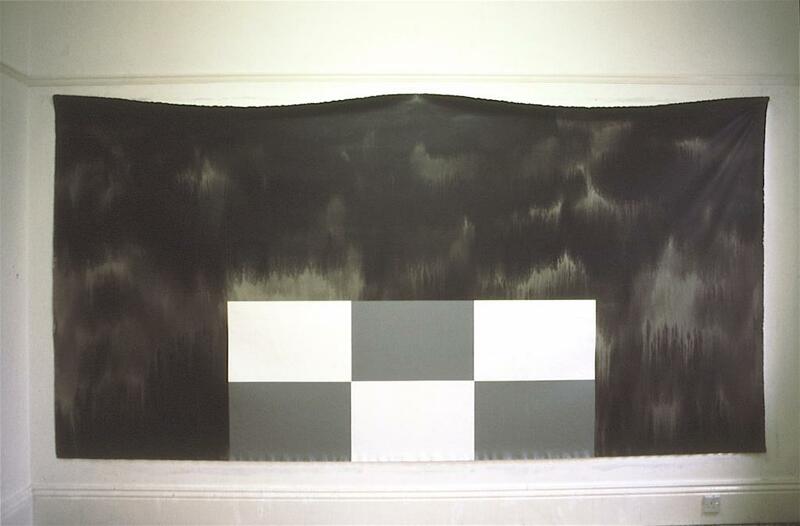 Her paintings are abstracts filled with bold colours and shapes, and often incorporating other items such as muslin and sand; she cited amongst her influences Antoni Tàpies and that interest can be seen in her work. Watering My Roots “is about taking care of yourself and nurturing yourself”. Get Ready to Hold Your Breath is right. Chelsea’s paintings also incorporate a small stamp in the corner, made with a kit from Hong Kong her father, who still lives in South Africa, gave to her, and it reminds her of him. There are also very different works by other artists on show. 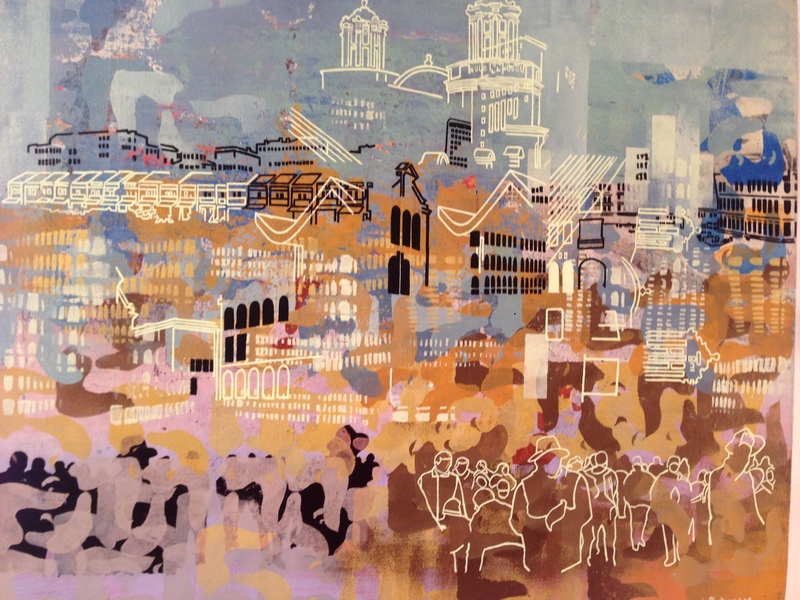 Phil Davis’s works are detailed and bright, overlaying people and London skylines. 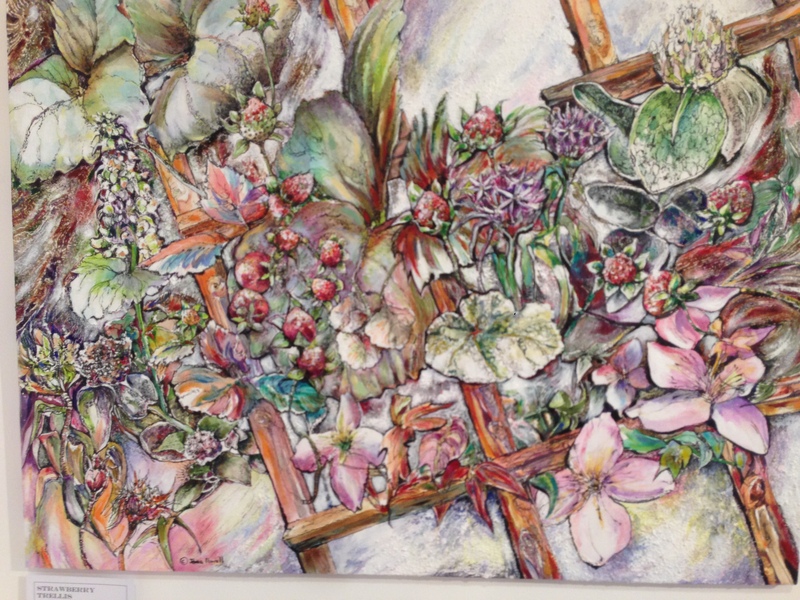 Tessa Pearson’s show different flowers in close up, and Jane Powell’s paintings include Strawberry Trellis, a packed study of vegetation through a trellis. Iso Bella is showing several pleasant landscape studies, and Lousie Morgan’s watercolours are tiny. Sonia Bublaitis’s Tree of Life is gold leaf on a black Perspex background. The show is on until November 12. What’s better than one art exhibition opening with Prosecco on a Friday evening? Two! Specially when the second one was completely unexpected. And the artists are twins! The exhibition opening at the Deasil Gallery in Oxford Street in Leamington offered pictures by about a dozen photographers and a painter. After enjoying a chat with artists, fizz and nibbles with the two Kates who run Deasil, I was off home until I passed the Whitewall Gallery in Regent Street and was drawn in by the sight of a tray of sparkling full glasses in the window. The occasion was the unveiling of a set of paintings by Chris and Steve Rocks, 30-year-old twins from Durham who studied art together in Leeds, and work together. 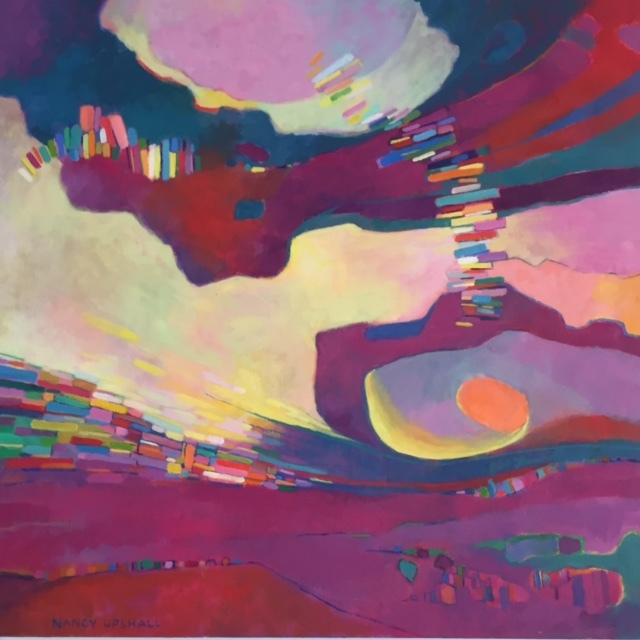 The paintings are described as tributes to the power of nature, and are on a tour of Whitewall Galleries around the country, along with the artists. It seems the paintings will only be on show there for a few days before they and the artists move on. At Deasil, you have until October 2 to see the new exhibition. Stuart Ellis’s abstract paintings fill the small back room, and the photographs out front are vary varied in style. A number wouldn’t be out of place in a classy travel magazine; James Callaghan’s Antigua photographs make you long for the blue sea and sky, and Matthew Sugars’s works make St Michael’s Mount in Cornwall mysterious and Venice as attractive as it is. Hilary Roberts has, in her word, fiddled with the images digitally to make a Cuban car stand out against a fading background, and to turn wave marks in sand into trees. Ray Spence’s black and white images date from 25 years ago and use altered negatives taken on film. 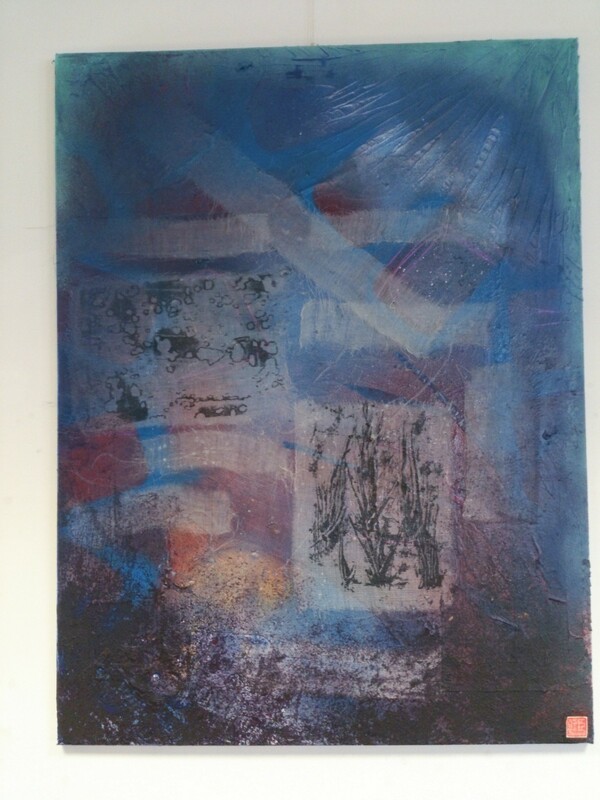 Other artists use mixed media, cutting, collage and old postcards to interesting effect; more detail to follow in the Coventry Telegraph on Friday.